Team Atlantis - "Eyes of Bushongo"
As discussed under Team Atlantis: "Ragnarök," the TV series based on the film was cancelled when the film, uh, tanked. 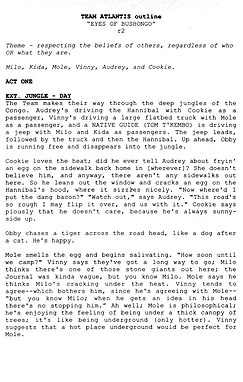 "Eyes of Bushongo" was my second script, and it was at the detailed outline stage when things got wet. "Obby," mentioned below, is the funny Atlantean animal that had been added by this time.